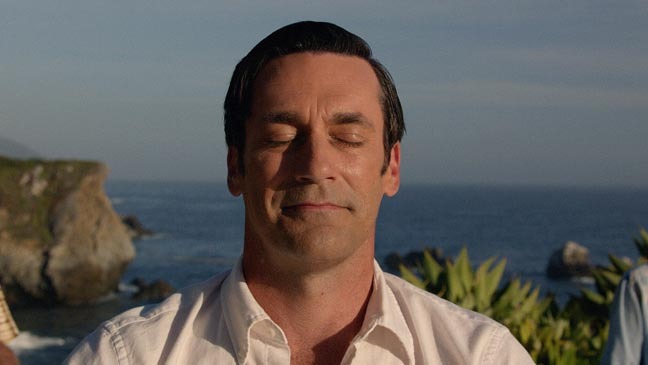 The dark Mad Men ends: narrative arc, musical bliss & a smile. —“I’d Like to Teach the World to Sing,” which originated as a jingle, “Buy the World a Coke,” for Coke’s iconic “Hilltop” commercial. Mad Men captured the excesses and brio of the late 1959s, the 1960s, and the early 1970s. As I explained in 2012 when I drifted away, its fitting climax seemed to be when its main characters formed their own Madison Avenue advertising agency. That’s when a respectable novel would’ve ended. But I drifted back, partly because Don Draper and his times reminded me of my father. Now I’ve watched the rest, and binged on the seventh and final season. I found the show’s last year riveting—especially once the principal players of Sterling Cooper Partners were absorbed by the mother ship, sent to McCann Erickson, which had since bought a majority interest in the scrappy underdog. Even by the sexist standards of the time, McCann Erickson is a dreadful place for the women, and controlling and soulless for everyone. But the Sterling Cooper partners will become millionaires if they can hang on for four years and fulfill the basic terms of their contract. Can they? One by one, the answer is, basically, no. As they choose their fates, I was reminded of the famous ending of Six Feet Under, which flashed forward to the characters’ deaths. For these Madison Avenue men and women, however, they get another chance. How satisfying to see Pete Campbell, head of accounts, who’d been humbled by his own meanness, insecurity, and egotism reconcile with his wife and fly off to a spiffy new career with Lear Jet. Instantly I remembered him at his worst, when he tried to destroy Don by revealing Don’s tawdry past and assumed identity. This in turn emphasized how the two later became allies and even friends in the show’s long arc. As Sterling Cooper’s brilliant creative director, Don is McCann Erickson’s big prize and great hope. He’s been handed their Coke account! At first he plays along, but then takes a road trip and disappears. Is this one of his periodic battery-recharging hegiras or is he finally self-destructing for good? Wandering America, he’s stranded by car trouble and beaten by members of a backwater VFW post who’d tried to make him their improbable buddy; he ends up test-driving racecars on the Utah salt flats with a much younger, hairier crew. This all sounds ridiculous as I write it, but was somewhat believable in context. Don was both haunted and uber cool and competent. Of course he ends up, as always, in California. This time he lands in the bosom of its burgeoning early 1970s self-actualizing culture. He seems deeply depressed, maybe shattered, teetering on the brink. The two following scenes floored me. There’s Don in a lotus pose atop a surf-smashed cliff, and then Coke’s all-time iconic commercial, 1971’s “I’d Like to Buy the World a Coke.” As the implication of cutting from Don suddenly smiling to the Coke commercial dawned on me, I felt delight in creator Matthew Weiner’s deft storytelling. Don was first and foremost an ad man, not a tortured filmmaker or writer or hardware shop proprietor. It was perfection that he’d return and forge his life experiences, emotional restoration, and instinct for the zeitgeist into a legendary TV commercial. He survived after all, thank goodness. And boy did he prosper. The ending underscored that Mad Men was always about growth—and burning your baggage for fuel if necessary. How fitting it came to rest on redemption. Hi, Richard. Thanks for bringing me up to date on “Mad Men.” I actually can count on one hand the number of episodes of it that I’ve seen, because it’s on too late, and I’m an “early to bed” sort of person. But I watched some of it at a friend’s house a couple of years ago, and have always wanted to know what happened to the characters. You don’t need to issue any spoiler alerts for me at all! Thanks, Victoria! One day you might immerse, having forgotten my modest reveals here.